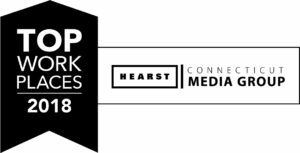 Thinklogical, A Belden Brand, has been awarded a 2018 Top Workplaces honor by Hearst Connecticut Media Group. This is the fifth year Thinklogical has been recognized with this award. The Top Workplaces lists are based solely on the results of an employee feedback survey administered by Energage, a leading research firm that specializes in organizational health and workplace improvement. Several aspects of workplace culture were measured, including Alignment, Execution, and Connection, just to name a few. Thinklogical was one of 50 employers selected as a Top Workplace out of nearly 1,000 organizations invited to participate. Thinklogical, A Belden Brand, is manufacturer of highly-secure KVM (keyboard, video, mouse), audio, and computer peripheral signal extension and switching solutions. Government, entertainment, scientific and industrial customers worldwide rely on Thinklogical’s products and services for security, high performance, continuous operation and ease of integration. An ISO 9001:2015 certified company, Thinklogical is headquartered in Milford, Conn. and is part of St. Louis-based Belden Inc.
Headquartered in Exton, PA, Energage specializes in employee feedback surveys and workplace improvement. This year alone, more than two million employees in over 6,000 organizations will participate in the Top Workplaces™ campaign—a program it conducts in partnership with more than 40 prestigious media partners across the United States. Energage also provides consulting services to improve employee engagement and organizational health.